This past weekend, David and I went to see The Imaginarium of Doctor Parnassus. While the film isn’t perfect, I am pleased to report that it manages to accomplish pretty much everything I want to see in a high-budget Hollywood blockbuster, which is saying something. (If you know me, you are likely aware that I’m not the world’s most patient moviegoer). 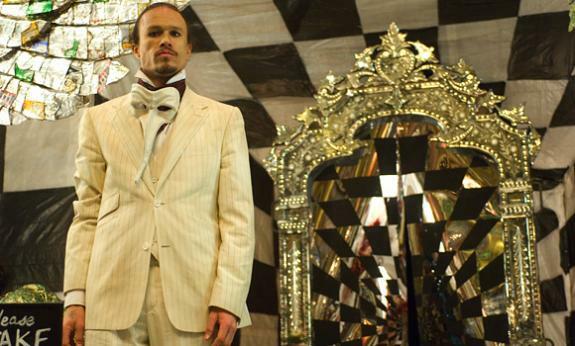 Heath Ledger in "The Imaginarium of Doctor Parnassus." Of the press Imaginarium has received so far, much has focused on the apparent curse surrounding its making. Heath Ledger’s death 2/3 of the way through filming forced director Terry Gilliam to improvise, hiring Johnny Depp, Colin Farrell and Jude Law to play Ledger’s character Tony. (These casting transitions are seamlessly explained by the fact that Tony’s face changes every time he passes through a magic mirror into the Imaginarium.) Upon researching the film on Wikipedia, I also learned that producer William Vince died of cancer immediately following the filming and Gilliam himself was hit by a car during post-production. Spooky. 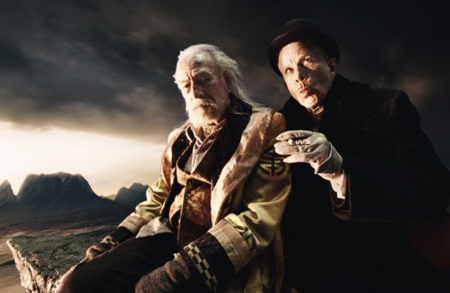 The plot revolves around a thousand-year-old mystic and storyteller named Dr. Parnassus (Christopher Plummer), who operates a traveling sideshow, which he uses to win souls in order to settle an ongoing series of wagers with a Mephistophelian devil named Mr. Nick (Tom Waits). The action is dreamlike, wrapping itself around a sometimes forced, yet consistently entertaining narrative that supports the real story: a shape-shifting morality play about the loss of the importance of “storytelling” (that is, psychologically constructive myth-making) in a society whose primary values are convenience and complacency. All of this is accomplished through a series of lush explorations of identity, desire, and the act of confronting one’s fear of death. Visually, the film is full of psychedelic/shamanic imagery—occult emblems, mirrors, black and white patterned surfaces, loaded symmetries, a girl who is identical with her own mother, a hero whose identity is fluid and must be sacrificed—all indicating that the plane on which these events unfold is an archetypal one. The relationship between the story and the real-life events surrounding the filming further embeds the film in a multifaceted matrix of self-similarity. All in all, The Imaginarium of Doctor Parnassus is one of the more spiritually astute movies I’ve seen lately, with a visual impact that must be viewed on the big screen to be fully appreciated. If you find your interests and tastes aligned with mine, I recommend it! ~ by emilypothast on January 26, 2010.